Have you been suffering with depression, family dysfunction, marital unhappiness, or other problems and been unable to overcome them? 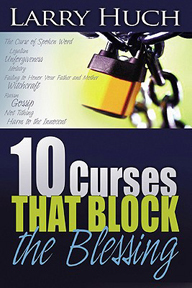 Within the pages of this groundbreaking book, Ten Curses That Block the Blessing, Larry Huch shares his personal experience with a life of anger, drug addiction, crime, and violence. He shows how he broke these curses and reveals how you can recognize the signs of a curse, be set free from generational curses, and restore your health and wealth. You don't have to struggle any longer. Choose to revolutionize your life. You can reverse the curses that block your blessings!